The Hand of Welcome: Hospitality in our three faiths. With hospitality as our theme the conference began by acknowledging the Wurundjeri people, their care for the land and giving respect to their elders. This was also done during the conference. We also acknowledge the great hospitality shown to the conference by Pallotti College with Brother Lindsay Rust on the Winter Conference Committee as host and a team of volunteers meeting all our culinary needs. 37 people were in residence for the conference. Of these 16 were first timers, 3 had been to all previous conferences and 2 were founding members of JCMA. There were 10 Jews, 22 Christians and 5 Muslims. 3 visitors came for a day – Rabbi Ian Goodhart to do the text study, Ms Karen Tuch to speak about Jewish Aid and Sr Brigid Arthur to speak about the Asylum Seeker’s Project. As the conference participants arrived they were registered in four colours, purple, green, beige and red, which would be the cluster groups they would belong to for the conference. An informal lunch was provided of soup and rolls and this worked well as people came in at various times. On the first evening an opportunity was given for the participants to meet in their own faith groups to get to know each other and organize their presentations. Each day participants met in their coloured cluster groups which were organized so that the three faiths were represented in each group. Facilitators were also prepared to lead the groups and help people to share their responses to the program and personal journeys. Prayer traditions from each of the faiths were shared each evening and in the morning the day began with a creative contemplation from each faith. The Monday morning session was a text session. The Jewish and the Muslim texts were about the story of Abraham and Sarah and their hospitality to three strangers. The Christian text made reference to that story but concentrated on the teaching of Jesus about hospitality in word and story. 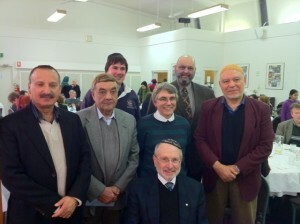 Jewish Text Study was presented by Rabbi Ian Goodhardt. One of the Jewish emphases was that in hospitality it is important to say little and do much. A tradition about Abraham was that his tent was open on all sides welcoming strangers from the North, South, East and West. Islamic Text Study was presented by Riad Galil. A Muslim emphasis was that it is a moral obligation to treat guests cordially with respect, love and peace as the prophet Abraham while not knowing his guests offered them the best. Christian Text Study was actually shared between 4 presenters. One of which was Harry Kerr that we have here. A Christian emphasis was that the hospitality of God is all embracing especially to those who are outcasts and expect nothing. The Monday evening session was very powerful as three people told their own stories of what has brought them to their present faith. Each of the people had a story of searching and pain as well as joy in going through transitions from one faith to another or making an intra faith journey. 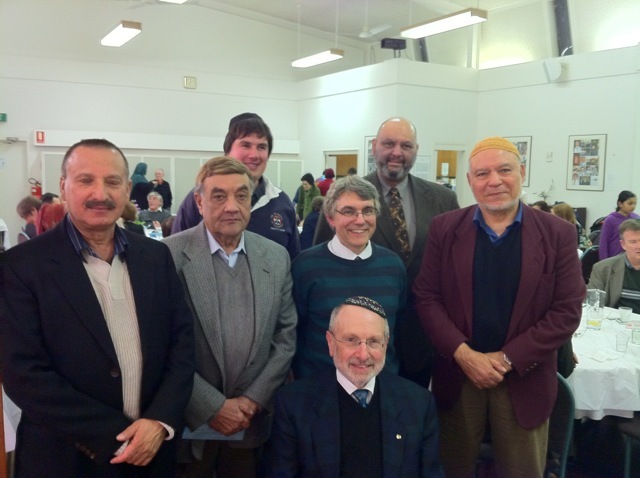 On Tuesday we dealt with some of the practical issues and difficulties with hospitality between the three faiths. A practical Muslim teaching is that you offer hospitality for three days but after that it becomes charity and the onus is on the guest not to impose on the host. Another saying was on the first day you kill a cow for your guest, on the second a sheep, on the third a fowl but on the fourth day you give your guest beans. Questions of how to deal with different foods and drink were raised and how to refuse in a non offensive way. Broader issues of intra faith divisions when dialogue has been closed off were also raised. There were no easy answers. The Muslim participants treated us all to Muslim hospitality by setting up a model Iftar dinner. We shared the custom of breaking the fast with a date and water, observed the Muslim Maghrib prayer and then joined in a feast with food from Pallotti college and Middle Eastern pastries. Tuesday after dinner included a soapbox session which ranged from children’s stories to the work of volunteers at Pallotti. This was followed by the filming of Babette’s feast –(a great film on hospitality) to which the Pallotti volunteers were invited. Alongside the film there were discussions about ideas for future conferences and whether we should mark the tenth anniversary of September 11th, 2001 in some way. Further work on these matters has been left to the JCMA board. On Wednesday we heard from speakers involved in practical hospitality around Melbourne – the asylum seekers project sponsored by the Brigidine community, a homework program for young Somalians with Jewish University students as tutors sponsored by Jewish Aid, and the work of Springvale Neighbourhood House where Samar Mougharbel one of the conference participants is co-ordinator. Members of the conference brought hospitality gifts of food and medical supplies which were passed on to the speakers. Samar told us that her house didn’t handle food and so she would be able to give the food to Springvale Community Care. Here was a practical example of handling a difficulty with a hospitality arrangement. The conference concluded with the participants singing a Hebrew song of praise in three parts, a summary of our journey in hospitality and hospitable greetings to each other indicating our growth in hospitality through this conference.